The Doosan Bobcat facility in Dobříš, on the outskirts of Prague, estimates that it manufactures a whopping 80% of the machines destined for markets in Europe, the Middle East and Africa. An impressively large market share – yet with great power comes great responsibility. More than 200 people work across the Doosan Bobcat site, which includes offices, a manufacturing facility centre and an outside testing facility. In order for the company to continue its leading role in the market, Doosan Bobcat has invested nearly €20 million into building its own Innovation Centre on-site. The facility serves as an expert research and development centre for all Doosan Bobcat teams across Europe, the Middle East and Africa. The original building opened in 2003, after a development centre for Bobcat compact loaders and excavators was established in a former facility close to the current site. Twelve years later, the Innovation Centre was officially opened, backed by millions of euros worth of investment. From idea to final product, every step is closely monitored within the facility by its 55 engineers. With so much going in to the design and manufacture of each machine, it’s no surprise that it takes on average three years from start to finish to complete a project. A short walk through the Innovation Centre allows you to see the commitment to detail. It all begins in the engineer’s design areas, where engines are built and tested. Once the engine gets the go-ahead, a process that can take months, it’s onto thorough specification testing. To claim the machines are put through their paces would be a huge understatement. Products all but jump through hoops to reach Doosan Bobcat’s highest standards of safety, durability and engineering excellence. For example, machines are required to use a high-axis tilting platform to measure how well they would perform on different slopes. Similarly, there is a deep pit for testing the machines’ maximum weight capacity, ensuring safety as a priority. Whether it’s the deserts of Africa or the forests of Alaska, Doosan Bobcat has to ensure its machines are fully operational in every climate. As a result, the Innovation Centre contains a climactic chamber which evaluates a vehicle system performance in extreme weather conditions. Its freezer goes down to an unthinkable -40ºC – fortunately not a temperature Britain has to deal with, but a reassuring test that guarantees a machine’s ability to deal with those chilly mornings. Testing in the chamber includes cold-start testing, hot-condition evaluation and cover engine and hydraulic system cooling performance. One of the main beneficiaries of the centre’s substantial investment is its acoustic chamber, which serves as a noise-testing facility. 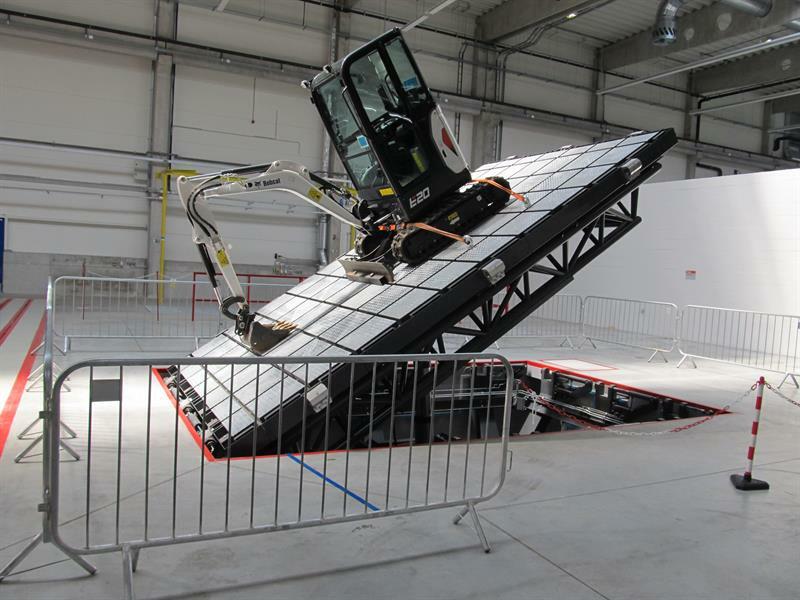 Manufacturers are legally required to publish the noise specifications of the machines they produce and this has to be tested in a large open space; in the past, Doosan Bobcat had conducted this testing on airport runways. However, this is incredibly expensive to set up and often manufacturers are at the mercy of unpredictable weather. 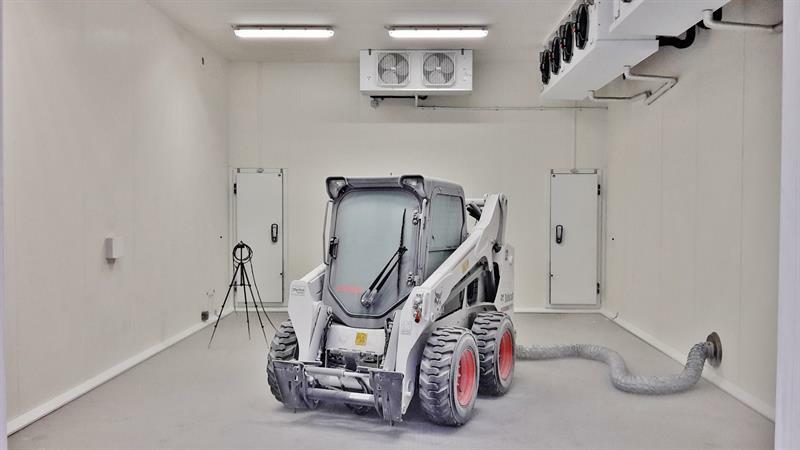 Therefore Doosan Bobcat took the somewhat unconventional decision to build a large acoustic chamber within its facility. The room is temperature-controlled, and even the doors contain acoustic pads to create a completely equal noise level across the room. It has now been certified as a testing zone, meaning all machines can now be officially tested on-site. So what does all of this investment mean for the waste industry? Doosan Bobcat is launching a new waste handler machine – the DL420CVT-5 Stage IV compliant wheel loader – which is the first Doosan model to be equipped with a continuously variable transmission (CVT). This means that the transmission uses both a hydraulic motor combined with a hydraulic pump, which provides a smooth and continuous speed variation. The wheel loader is beneficial to waste management sites as it uses both a mechanical and hydrostatic transmission in the same machine. This allows it to automatically transition from hydrostatic power at low speed to a mechanical system at higher speeds. By combining the two types of transmission, the new CVT technology ensures high loads can be carried at low engine speed, increasing machine performance for operators working in digging, loading and lifting operations. Operators can select between several driving modes that adjust the maximum engine rpm based on their preference. ‘Normal’ mode allows users to balance fuel consumption for everyday digging, grading and lifting tasks, whereas economy reduces fuel consumption for low-demand applications. Though the market is filled with a vast array of machines and technology, Bobcat has created what it hopes to be a market-changer – the ‘plug and play’ remote control. Planned to be released in 2018, the installation can be plugged into the back of a machine and after five seconds is connected to a remote, driven by an operator away from the site, effectively making it a remote-controlled toy – but on a much larger scale. By using the system, the operator has a full view of the machine’s surroundings rather than being restricted within the cabin, making the area a much safer environment with no blind spots. As well as reducing risks to workers, the remote could also cut labour costs as it will no longer require a number of workers to monitor the machinery in and out of the site. The plug-in comes with new Bobcat machines, or can be added to older models. As with all new bits of technology, it is up to the industry to decide whether it will be a success. Jiří Karmazin, production manager for Bobcat Loaders, who has overseen the project, says: “We’re trying to understand our customer’s needs and exactly what they are looking for. We know our competitors don’t have anything particularly similar, and we’ve been working on this one for 18 months. Developments in the materials-handling industry are moving quickly, and it’s up to companies such as Doosan Bobcat to keep up. With an even greater focus on safety and technology over the coming years, it’s becoming more important than ever for the big companies to invest in their production to keep the waste industry on side.